Rachel Roddy, after about 10 years of hard slog, is an overnight sensation. She’s just scooped the André Simon award for best food book in 2015, a very big deal indeed for a first book. I’d been warming up this second helping for a day or two before that news came through last Friday. My original reason for revisiting this episode was that her book, Five Quarters: Recipes and Notes from a Kitchen in Rome, is due to be published in the US tomorrow, 2 February, under a somewhat different title: My Kitchen in Rome: Recipes and Notes on Italian Cooking The different titles were just one of the things we talked about and that are worth sharing again; Rachel’s well-deserved award provides an extra reason. There’s a lot more packed into the original, full-length episode. 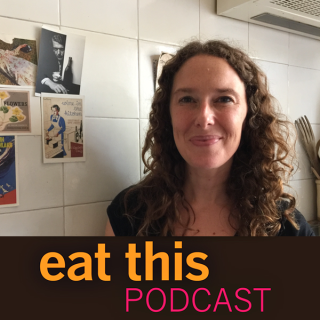 Rachel talked about how a website turned into a book and about how she’s discovering life and cooking in one of the less glamorous towns of Sicily, the subject of her next book.